Very unisex, very fresh - This soap is scented with bergamot, Italian lemon oil, basil and orange oil from Brazil. A spicy-floral heart of the lily of the valley, coriander and ginger leads to a long-lasting scent of precious woods, musk and amber. This Men's Soap has spicy notes of white pepper and saffron laced powder blended with notes of rose and seductive patchouli. 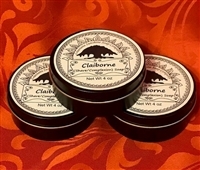 The very popular Claiborne Shave & Complexion Soap is now in a TIN! 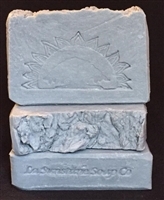 The bentonite clay in this soap has a great "slip" to it for shaving, which helps to reduce nicks and cuts. The essential oils and coconut carbon make it an excellent soap for complexion and/or shaving. The other oils make for a very foamy, creamy long lasting lather. This soap has an earthy woodsy scent from cedarwood essential oil, calendula extract, and oakmoss. It's fast becoming one of the best selling men's soap that I make. But a lot of woman have discovered it for themselves, too, because of the fresh scent. A refreshing crisp & clean scented soap made with Juniper Berry Infused Olive Oil & a "twist" of Lime Essential Oil. Will remind you of your favorite gin & tonic drink. This soap is inspired from Grand Isle, which is Louisiana’s only inhabited barrier island. 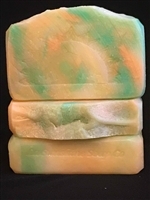 Sea salt, sea moss and green vetiver round out the fresh ocean fragrance used for this soap. Louisiana Avery Island Sea Salt is added to the bottom layer of the soap, which makes it very nourishing & soothing. Made with real Locally-brewed-in-Louisiana beer. This soap doesn't smell typically like you would think....The first scent you will smell is honey fragrance and then a scent of the earthy, hoppy scent under that. Men love this soap... Include this soap as a gift for any man on your gift list.